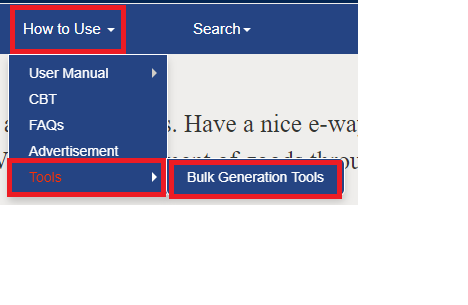 How to use Bulk Generation facility on the eway Bill portal? 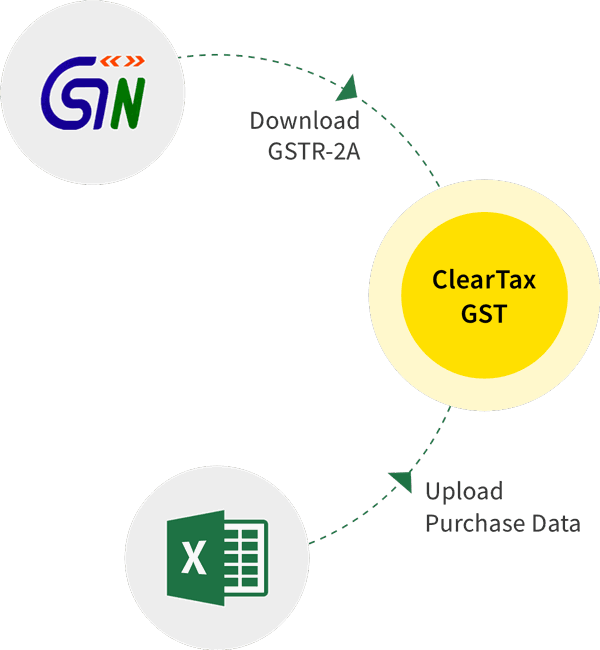 Large-sized business houses or logistic operators having many consignments across the country on a single day to handle would prefer a simple and time-saving system where they generate all the required e-way bills or Update vehicle details by a single file upload. This can be made possible by using the facility of Bulk generation of e-way bills on the e-way bills portal. 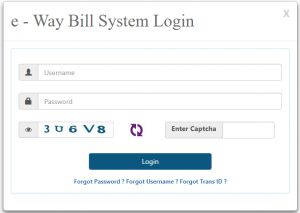 A bulk e-way bill option is used when a user needs to generate multiple e-Way Bills/ consolidated e-way bills/update multiple e-way bills in one shot by a single upload. In this article, we cover the step-by-step process to be followed for Bulk Generation of e-way bills /consolidated e-way bills on the e-way bill portal. How to prepare data for upload using templates? You should have the Invoice/ Bill/ Challan related to the consignment of goods. Transporter ID or the Vehicle number (for transport by road). Transporter ID, Transporter document number, and date on the document (for transport by rail, air, or ship). 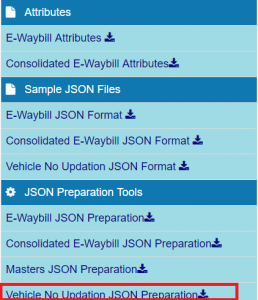 You need the EWB JSON template or EWB bulk converter or the excel template , to be updated for the particulars at points laid down between 2 to 4. 2. How to prepare data for upload using templates? Step-2: Update the downloaded file with the requisite details. The file in JSON is ready for upload. 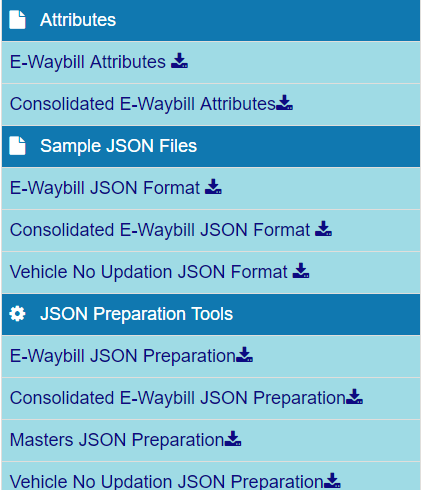 The tool helps convert the multiple e-Way Bills/Consolidated EWBs excel file into a single JSON file. Step-3: Update the .xlsx file (excel template) with the requisite details. Step-4: Use the .xlsm converter tool to convert the excel file into a JSON file. The resulting file in JSON is ready for upload. The second method i.e. using bulk converter tool to convert excel into JSON template is preferable over the first i.e. updating JSON template directly and using it. The reason being there is a validation that takes place when you convert the updated excel template into the JSON template, where any errors shall be reported to you for your corrections even before uploading the JSON file. Download the ‘Vehicle No Updation JSON Preparation’ template from ‘Bulk Generation Tools’ available under ‘How to use’ from home page tabs. Once the template is downloaded, fill up the details and validate the file by clicking on ‘Validate’ button in the excel file. After validating for any errors, Click on ‘Prepare JSON’. The JSON file is ready for use! Step 1: Login using the username, password and entering the captcha code. 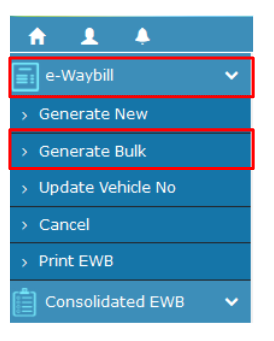 Step 2: Select ‘ Generate bulk’ under ‘E-waybill ’ option or ‘ Consolidated EWB’ option as per your choice, appearing on the left-hand side of the dashboard. 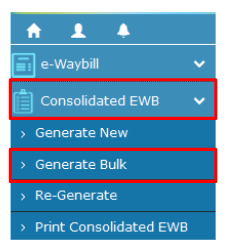 You can copy the resulting listed E-Way bills numbers and date of generation and paste the same in a document saved on your system for further action. Errors if any appear against each EWB entry. Make corrections accordingly and process it again. Step-2: Click on’ Choose File’ and Select the JSON file you want to upload. 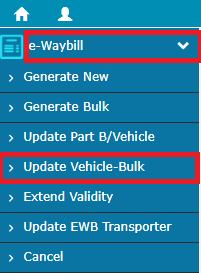 Step-3: Click on ‘Generate’ to update the vehicle details for the Eway bills inputted through the JSON file. Click on the desired file/format to Download.